Finally! 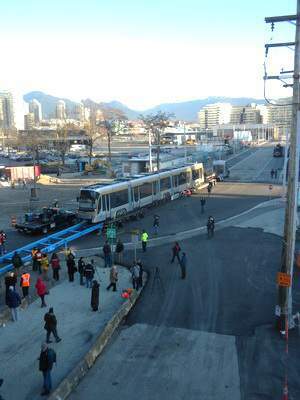 In time for the 2010 Winter Olympics and ParaOlympics: the arrival of the first streetcar shipped on loan from Brussels to the City of Vancouver. This is a demonstration project which will include the operation of 2 streetcars on a newly retrofitted light rail line along lst Ave., from 2nd Ave. Canada Line rapid transit station to Granville Island Public Market. The public will be able to ride this streetcar free during the Olympics from Jan. 21 to Mar. 21, 2010. Given forecasted road congestion and up to 35,000 daily visitors at the Market during the Olympics, this line should be well-used soon. Streetcar tram was manufactured by Bombardier . A thought: Is a large city truly sustainable if it does not have a good streetcar network? Is a streetcar network truly complete if it does not also easily accommodate the transport of bicycles?